Human trials are on the horizon for the potentially life-changing tech. Retinal degeneration is one of the leading causes of vision impairment and blindness in the world. The two most common retinal degeneration diseases are age-related macular degeneration (AMD), which affects more than 2 million people in the U.S.and retinitis pigmentosa (RP) which affects roughly 1 in 4,000. Both conditions cause loss of vision by damaging the photoreceptor neurons in the retina — as the loss of the ability to perceive light is what leads to loss of sight. A team of researchers, led by the Italian Institute of Technology, is developing a new method of treating retinal degeneration using a prosthesis implanted into the retina. It’s made from a thin layer of conductive polymer which is placed on silk-based substrate. Then, it’s covered by a semiconducting polymer which acts as a photovoltaic material, capable of replicating the function of the damaged photoreceptors. When light enters the eye, this device absorbs photons and the resulting electricity stimulates the retinal neurons. 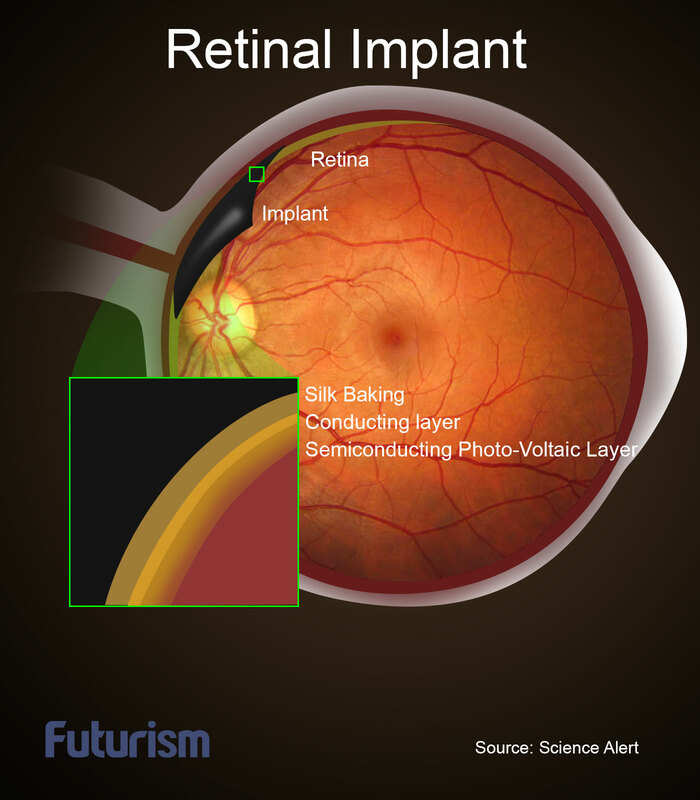 They have successfully tested this retinal implant in rats, and detail their research in the journal Nature Materials. The team used lab-grown rodents — named Royal College of Surgeons (RCS) rats — which are bred to develop the rat-version of retinal degeneration. About a month after these RCS rats were given the new retinal implants, the researchers tested them for pupillary reflex to determine how sensitive they were to light. The researchers found that the treated rats’ response to light with 4-5 lux medium intensity showed pupillary responses similar to those in healthy rats. When the researchers tested the rats 6 months later, then again 10 months after the surgery, the responses were the same, meaning the implants’ effect appears to be more than temporary. Although similar to the healthy rats, the treated RCS rats were shown to suffer some vision impairment due to aging. In order to make sure that the treated RCS rats were indeed capable of perceiving light, the researchers subjected their brains to positron emission tomography (PET) scans. They saw that the treated RCS rats showed increased activity in the brain’s primary visual cortex, which is responsible for processing visual information. “The rescue of the visual function is accompanied by an increase in the basal metabolic activity of the primary visual cortex, as demonstrated by positron emission tomography imaging,” the team reported. In short, the treated RCS rats could technically see again. Further research is still needed, though — because the researchers aren’t exactly sure how it works and whether or not the same success could be achieved in humans.